These images were found on another Council's site. They are presented here to help you learn some helpful knots. The bowline is used to make a loop at one end of a line. It can be used for tying things down and during a rescue. The Clove Hitch is used to start or finish lashings, roping off an area, belaying and binding. 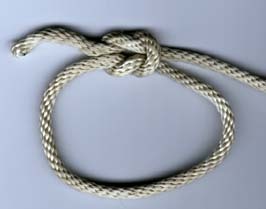 The Sheet Bend is used to join two ropes together. Useful when joining two ropes that are not the same size or strength. The Sheepshank is used to shorten a rope of remove slack. The Square Knot is a simple binding knot that can be used to secure a rope around something. It can also be used to tie two ropes together but a proper bend should be used for safety. The Tautline Hitch is used to secure objects. Useful when pitching a tent. It is adjustable without loosening. The Timber Hitch is used when tying to trees, branches and logs. The Figure 8 Knot is used for climbing and can also be used to tie two different ropes together.